Screw Compressor is the precision technology machine to get compressed air. Due to its troublefree operation, this type of compressor is most popular in the industry. Here I will share the information on screw air compressor with you because every engineering plant requires compressed air to perform various operations. To avoid various faults occurs during working on an air compressor, you have to know the working principle of the screw compressor. The working principle described here will apply to all screw air compressor manufactured by Atlas Copco, Ingersoll Rand, Chicago Pneumatics, ELGI etc. As the name indicates, this type of compressor is driven by electric motor or diesel engine. The rotary screw air compressor is a single stage, oil flooded, and rotary screw compressor driven by electric motor through a coupling. Nowadays two stage, an oil-free screw air compressor is also available in the compressor industry. Teflon screws are used in such type of Screw Compressor. Portable screw air compressor is mainly run by Diesel Engine. The compressor casing accommodates a pair of male and female helical rotors. These will be machined with the highest precision and mounted on rolling element bearings. A pair of ball bearings and roller bearings is used in drive and non-drive side. The male rotor has four helical lobes which mesh with six flutes of the female rotor. Hence the speed of the male rotor is 1.5 times higher than the female rotor. The male rotor is driven by coupling through step-up gears. The male rotor lobes rotate into the female rotor flutes. The air which is sucked through suction filter element trapped in the inner lobe spaces. So, it will smoothly compress until the lobe-flutes reach the outlet port. Pulsation-free air is delivered by screw air compressor, due to continuous compression takes place in all the lobe-flute spaces. The oil injected through the lower gusset of the air compressor casing mixes with the indrawn air. It ensures an efficient sealing between the rotors and the casing. This will also give an intensive cooling during the compression process. A Huge quantity of lubrication oil cools the compressed air; therefore intercoolers are not necessary for screw air compressor. The oil, which lubricates the compressor, also seals the clearance spaces. In air-cooled models, the oil is cooled in oil cooler by the separate fan motor. Whereas it is cooled by water, in water-cooled models. 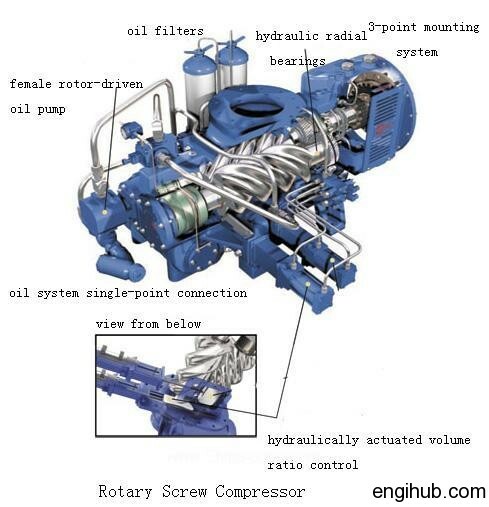 I hope the information above will help you understand the working of a screw compressor. To control various operations performed during working, many control valves are used. As like a minimum pressure valve, oil check valve, safety valve, intake/butterfly valve.